There are many children who seem undermotivated, disengaged, and underachieving. Many educators are frustrated by such students; some educators as they struggle with finding ways to engage those students, and some because they believe it is up to those students to be motivated or not. While it is true that the degree to which students are “self motivated” is a key factor of student academic success, the idea falls flat when it is accompanied with the assumption that there is nothing teachers can do to help students be more self motivated, when, in fact, there are strategies for creating the conditions for student to be self motivated. Great teachers have always struggled with the persistent question, “How do I motivate all children to learn?” (Although, the question is probably better framed as, “How do I create the conditions for students to be self motivated?”) And you are probably one of the ones wondering how to reach them (or I doubt you’d be reading this post). You are not alone. When you realize that people learn naturally from the life they experience every day, it won’t surprise you that the brain is set up to learn better with active, hands-on endeavors. Many students request less bookwork and more hands-on activities. The students I studied were more willing to do bookwork if there was a project or activity as part of the lesson. Building models and displays, fieldtrips and fieldwork, hands-on experiments, and craft activities are all strategies that help students learn. It may seem counterintuitive, but focusing on memorizing facts actually makes it hard for students to recall the information later. That’s because the brain isn’t accustomed to learning facts out of context. Higher order thinking (e.g. applying, analyzing, evaluating, and creating, within the New Bloom’s Taxonomy) requires that learners make connections between new concepts, skills, and knowledge and previous concepts, skills, and knowledge. These connections are critical for building deep understanding and for facilitating recall and transfer, especially to new contexts. Remembering things is important and a significant goal of education, but remembering is the product of higher order thinking, not the other way around. Involving students in comparing and contrasting, drama, and using metaphors and examples are strategies to move quickly into higher order thinking. Few people like being told what to do, but in reality, we all have things we have to do that may not be interesting to us or that we would not choose to do on our own. Nowhere is this truer than for children in school. So, how can we entice people to do these things? We often resort to rewards or punishments when we don’t know what else to do, but these have been repeatedly shown to be counterproductive and highly ineffective (Kohn, 1993). Instead, provide students voice and choice. Let them decide how they will do those things. This doesn’t mean allowing students to do whatever they want, but it means giving them choices (“Which of these three novels about the Great Depression would you like to read during this unit?”). Let students design learning activities, select resources, plan approaches to units, provide feedback about how the course is going, and make decisions about their learning. This focus area is often a missing motivator for students. Schools have long had the bad habit of teaching content out of context. Unfortunately, this approach produces isolated islands of learning, and often makes it easy to recall information learned only when they are in that particular classroom at that time of day; they are not as able to apply the information in day-to-day life. When learning is done in context, people can much more easily recall and apply knowledge in new situations (transfer). Making real world connections isn’t telling students how the content they are studying is used in the “outside world.” It’s about students using the knowledge the way people use the knowledge outside of school. 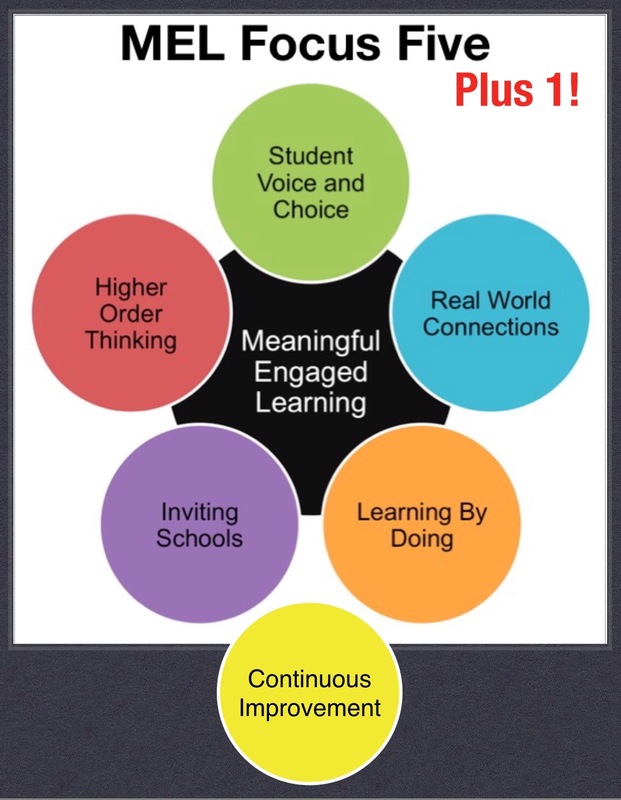 Effective strategies include finding community connections, giving students real work to do, and finding authentic audiences for work (think project-based, problem-based, and challenge-based learning). Continuous Improvement takes skilled guidance, direction, and coaching from thoughtful teachers, who will place emphasis on assessing frequently, providing timely formative feedback, coaching, motivating and nudging, and monitoring of progress. Learners need to know what they are aiming at (clear picture of the learning target), and to see fairly immediately how they did with meeting the target. They can gather the feedback themselves, or a guide or coach can provide the feedback (or both). But that feedback needs to be as immediate as possible, and needs to be detailed enough to lead to improved performance. Learners need the opportunity to make corrections on their next turn (and, therefore, need opportunities for next turns! ), and the next turn needs to be soon after the current turn. This isn’t about letting students just try and try and try until they get it. To focus on “re-do’s” is to focus on the wrong part. It is about strategically leveraging the clear target and the detailed feedback to improve performance. This entry was posted in Student Motivation & Engagement on March 2, 2016 by Mike Muir.